There is no other place in the world which offers so much thrill and excitement for a biker as Ladakh which is a paradise for them. Those who get a chance to travel to this remote Himalayan region on motorbikes are truly lucky.A biker would ride through few of the most challenging landscape in the world. You will pass through few of highest mountain passes in the world; Rohtang Pass, Tang Lang La or Baraclah La in Ladakh valley depending on the route that you wish to take. 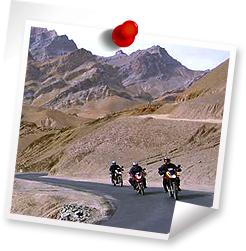 Most of the bikers feel excited to drive to Khardung La Pass which is known as highest motorable road in the world. Besides driving on high mountain roads, you may also explore pristine lakes of Tso Moriri, Pangong or Tsokar. For more adventurous, they may ride along Zanskar and Indus River. Irrespective of which route you go, you will always come across magnificent Buddhist Monasteries, valleys and remote villages where you may interact with local people and appreciate their simplicity and culture. The motorbike tours to Ladakh are exciting but not easy as you have to ride at altitudes of more than 3500 metres with uncertainty of road and weather conditions. That is why you need help of an experienced and professional tour operator to make this experience a hassle free and memorable. Upon arrival in Delhi meet our representative at the airport and he will take you to the hotel. Overnight stay at hotel. After breakfast, departure by van for Manali. This would be a long drive and may take even more than 12 hours. Arrival at Manali in the evening and overnight stay at hotel. Our guide you hand over your motor cycles and prepare yourselves for the adventure ahead. Manali is situated in the beautiful Kullu Valley, which holds a cultural and religious significance as the home of saptarshi (seven sages). The trout-filled Beas River gurgling down the mountains, Scenic hills dressed in lush green attire and spellbinding valleys scented with the smell of pines; all of them complement each other in the perfect manner to create the magical realm of Manali. What could be a more perfect place to go for a test ride on your motor bike and get used to the cuts and curves of this hilly area. Overnight stay. After breakfast, start your expedition towards Ladakh. You have to be ready with your gloves and helmets and get ready with your motorcycle to immediately climbe steeply up through the clouds. As we reach the snowline the sun will begin to disperse the mists, revealing the most sensational views ever imagined. Endless valleys stretch out in every direction from the 3,978-metres Rohtang Pass, where we enter the remote world of the Lahaul Valley. Enjoy beautiful view of Chadra and Bhaga rivers and drive through beautiful villages of Lahaul valley. Reach Jispa and overnight stay. In the morning, get ready on your motor bike for Sarchu leaving Jispa behind, enter the Greater Himalayan landscape. Enjoy the splendid view as you pass through the Baralachha Pass (5000 meters above sea level). Every turn into a new valley produces a breathtaking change of texture, colour and formation. Enormously deep river canyons combine with ice, wind and rain to carve impossible sculptures out of rock and gravel. We might find water gushing across the road from glacier melt, causing us to dismount if deep and the water is cold. Keep driving towards Sarchu which is the border line between Kashmir and Himachal. From there, get to the Sarchu camp which is our destination for today. Begin riding to Tso Moriri Lake. You will pass through Taglang La, nestled at an altitude of 5328 m above the sea level, in the Zanskar range, Taglang La Pass is the second highest mountain pass in Ladakh, the pass provides for a scenic view as it sways away from the main highway. Abundant vegetation on both sides further cools the already chilled air and at times, the pointed bends provide just the adrenaline push adventurists crave for. Continue ride to Tso Moriri which is the largest high altitude lake in Ladakh. The lake is situated about 250 km from Leh and it is about 29 km long and up to 8 km wide at a height of approximately 4500 mt above sea level. It is one of the most beautiful lakes with pristine blue water and surrounded by high mountains and snow-capped peaks located in secluded and picturesque Rupsha Valley. Overnight stay in camp on lakeside. Morning enjoy the lake side and visit Korzok village situated on northwest side of the lake. The village is habituated throughout the year. The Korzok monastery which lies on western bank of Tso Moriri Lake is about 400 years old and an important Buddhist pilgrimage site. Korzok is also the final point for motorists as the vehicles cannot go beyond this place. Tso Moriri is also a wetland sanctuary and is home to migratory birds, marmots and Tibetan wolves. The un-ending vastness and pristine untouched beauty of the lake is a treat to eyes of all visitors who come to visit this spectacular lake. Later leave for Leh and upon arrival check in at hotel for overnight stay. In the morning after breakfast, visit Thiksey Monastery which is the finest example of Ladakhi architecture. This Monastery is located on the top of a hill in solitude which lies at a distance of 20 km from Leh. It is a massive twelve storey monastery complex with a number of stupas, statues, thangkas and wall paintings. There is also a large pillar engraved with Buddha’s teachings. Then visit Shey monastery and palace that is located 15 km from Leh. It was built in sixteenth century A.D. This monastery has a 10 meter high gilder copper statue of Lord Buddha. Finally visit Hemis Monastery is the opulent or prosperous monastery in India and notable for its rich collection of ancient remnants like the statue of Buddha made of copper, stupas made of gold and silver. Monastery also has sacred Thangkas, murals and various artefacts. Situated in the foothills of Indus at a distance of 45 km from Leh, the monastery has access to motorable roads. The massive structure of Hemis Monastery is unique and depicts a specific style of architecture. Overnight stay at hotel. Morning leave for Nubra Valley whose natural beauty will astonish you. Stop en route at Khardung La Pass which is said to be the mightiest motorable pass in the world. Every visitor who comes here takes his photo with the signboard that claims it to be highest motorable road in the world as a souvenir. Continue riding to Nubra and in the afternoon visit Sumur village and a beautiful monastery there. Return to camp for overnight stay. Morning visit Diskit and Hunder Monasteries. Diskit, established in 14th century, is the oldest and the largest monastery in Nubra Valley. You can enjoy great views of the valley from this monastery. Also visit Hunder Monastery which is just below Diskit and houses a beautiful statue of Buddha. Later get ready to return to Leh and upon arrival check in at hotel for overnight stay. After breakfast ride to Uleytokpo and on the way visit Likir Monastery which was founded in the year 1065 by Lama Duwang Chosje under the reign of the fifth king of Ladakh. Then visit Alchi which is located at the distance of 69 km west from Leh. Alchi village is ancient site which is known for its Alchi monastery. It is known more as a complex of temples. The monastery is situated on the banks of River Indus and is the only monastery situated on the plains. Finally drive to Uleytokpo which is the most serene and beautiful campsite in Ladakh. Overnight stay in the camp. After breakfast ride to Lamayuru Monastery which was built in the 10th century. The monastery is situated between Kyagar and Sumur villages. Belonging to Red- hat sect of Buddhism, the monastery is famed for its opulent wall paintings, murals, scriptures, collection of Thangkas and statutes of different form of Buddha. On the way to Leh, also visit Rizong Monastery which is located in the remote end of the valley. Continue ride to reach Leh and overnight stay at hotel. Transfer to Leh airport to catch your flight for onwards destination.